Treponema pallidum is a spirochaete bacterium with subspecies that cause treponemal diseases such as syphilis, bejel, pinta, and yaws. The treponemes have a cytoplasmic and an outer membrane. Using light microscopy, treponemes are only visible using dark field illumination. Some variation occurs as to which are considered subspecies, and which are species. The cause of pinta is sometimes described as Treponema carateum, rather than a subspecies of T. pallidum, even when the subspecies convention is used for the other agents. This bacterium can be detected with special stains, such as the Dieterle stain. T. pallidum is also detected by serology, including nontreponemal VDRL, rapid plasma reagin, and treponemal antibody tests (FTA-ABS), T. pallidum immobilization reaction, and syphilis TPHA test). T. p. pallidum is a motile spirochaete that is generally acquired by close transplacental passage during the later stages of pregnancy, giving rise to congenital syphilis. The helical structure of T. p. pallidum allows it to move in a corkscrew motion through a viscous medium such as mucus. It gains access to the host's blood and lymph systems through tissue and mucous membranes. The subspecies causing yaws, pinta, and bejel are morphologically and serologically indistinguishable from T. p. pallidum (syphilis); however, their transmission is not venereal in nature and the course of each disease is significantly different. In the 17 July 1998 issue of the journal Science, a group of biologists reported how they sequenced the genome of T. pallidum. The recent sequencing of the genomes of several spirochetes permits a thorough analysis of the similarities and differences within this bacterial phylum. T. p. pallidum has one of the smallest bacterial genomes at 1.14 million base pairs, and has limited metabolic capabilities, reflecting its adaptation through genome reduction to the rich environment of mammalian tissue. 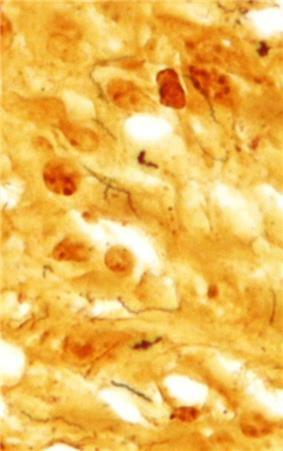 The shape of T. pallidum is flat and wavy, unlike the other spirochetes, which are helical. No vaccine for syphilis is available as of 2014. The outer membrane of T. pallidum has too few surface proteins for an antibody to be effective. Efforts to develop a safe and effective syphilis vaccine have been hindered by uncertainty about the relative importance of humoral and cellular mechanisms to protective immunity, and because T. pallidum outer membrane proteins have not been unambiguously identified. ^ Antal GM, Lukehart SA, Meheus AZ (January 2002). "The endemic treponematoses". Microbes Infect. 4 (1): 83–94. ^ Fisher, Bruce; Harvey, Richard P.; Champe, Pamela C. Lippincott's Illustrated Reviews: Microbiology (Lippincott's Illustrated Reviews Series). Hagerstown, MD: Lippincott Williams & Wilkins. ^ Fraser CM, Norris SJ, Weinstock GM, et al. (July 1998). 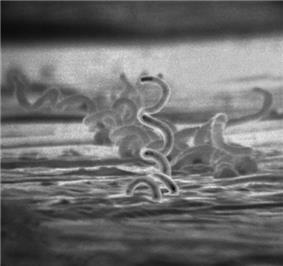 "Complete genome sequence of Treponema pallidum, the syphilis spirochete". Science 281 (5375): 375–88. ^ Tomson FL, Conley PG, Norgard MV, Hagman KE (September 2007). "Assessment of cell-surface exposure and vaccinogenic potentials of Treponema pallidum candidate outer membrane proteins". Microbes Infect. 9 (11): 1267–75. M. Althouse, Benjamin; Herbert-Dufresne, Laurent (July 17, 2014). "Epidemic cycles driven by host behaviour". Interface: 1. Retrieved November 6, 2014.